The bad news from the timetable change in December was that Deutsche Bahn stopped all its night trains. The good news was that Austrian Railways (ÖBB) has taken over some of the routes under the new brand name NightJet. If you want some background on this change I was quoted in the FT talking about it. ÖBB’s NightJet page is here. I haven’t actually taken a NightJet yet, but today I have tried to book one. And it was not a pleasant experience, hence this blog entry. My trip will be on board NightJet 471, the new Hamburg – Berlin – Basel SBB – Zürich service (timetable here). I will travel on it from Berlin Hbf as far as Basel SBB on Monday 13th March, arriving in Basel in the morning of Tuesday 14th March. There I will connect onto a SBB IC via Biel/Bienne to Genève. 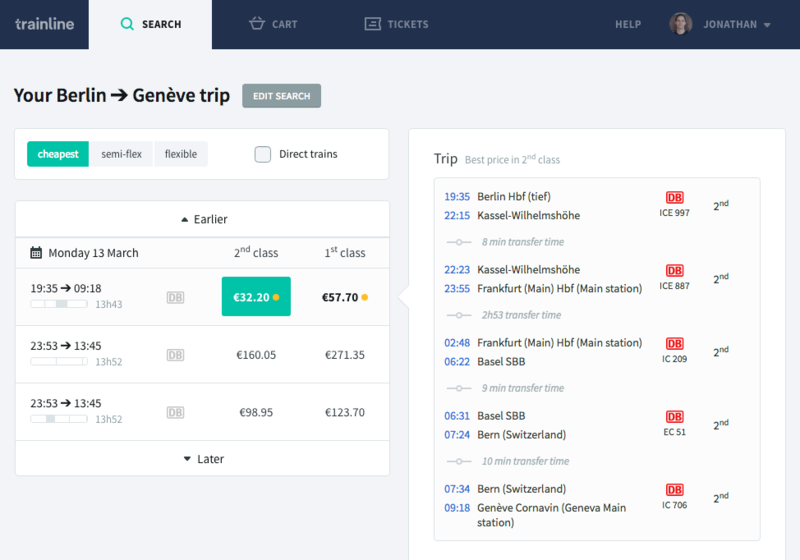 Doing this trip – Berlin to Genève via Basel SBB – is very simple to book if you’re on daytime train – you book it all with Deutsche Bahn, you get a Sparpreis Europa Schweiz ticket, and it can cost you as little as €39 single, and even less if you have a BahnCard. Likewise when the night train was run by DB, booking was simple – it just cost a bit more for a Liegewagen or Schlafwagen reservation. But what about the situation now? I need to travel from Germany to Switzerland, but part of it on an Austrian train! Before we start, a recap about tickets. German and Austrian railways essentially have two sorts of tickets – Normalpreis or Flexpreis are tickets that can be used on any train and are expensive. Sparpreis can be used on just the train you are booked on, and are much cheaper. These tickets can be booked into the neighbouring countries. Note however that Swiss railways, when on Swiss territory alone, essentially only has Normalpreis tickets. All clear? So let’s start. €215.40, before I have even added on the cost of a Liegewagen (€20) or Schlafwagen (€40), and no Sparpreis available (and note: routing it via Biel/Bienne rather than Bern, with a later arrival, makes no difference to the price). The ticket price reduces as it should if you have a DB BahnCard – ticket is €162.55 with a BahnCard 25. So how about ÖBB’s own site? Once you’ve mastered the horrid interface it gives a much better price – €107.40, and it’s €20 to add a Liegewagen reservation and for some reason €60 to add a Schlafwagen reservation, while that’s €40 with DB above. 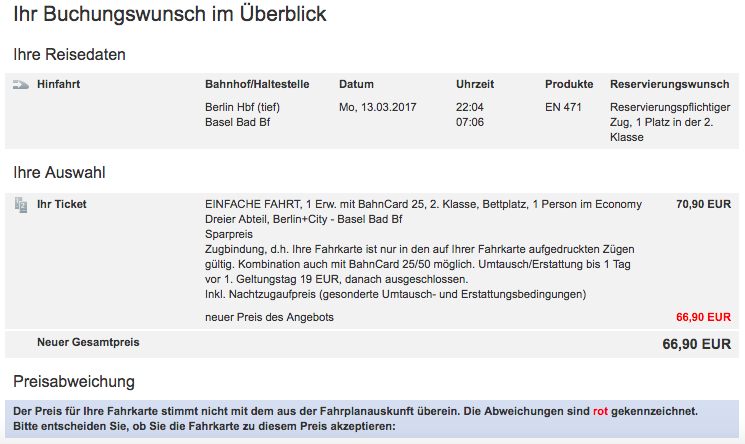 There is a small BahnCard reduction if you add that in ÖBB’s search – ticket is €90.30 with a BahnCard 25. This time though you cannot save anything with a BahnCard on the Spar-Night tickets. The answer is the Normalpreis for Basel SBB to Genève, booked with ÖBB, is €68.40 – and ÖBB adds that onto its cheap Spar-Night. Also note here that the usually excellent third party rail booking websites Trainline.eu (screenshot) and Loco2 (screenshot) are even worse at this than DB and ÖBB are, as neither of those even have the NightJet train I need in their search. To cut a long story short: I essentially cannot get a Sparpreis all the way from Berlin to Genève. This strikes me as a pretty major shortcoming of this whole NightJet business! So then, what is actually the solution here? 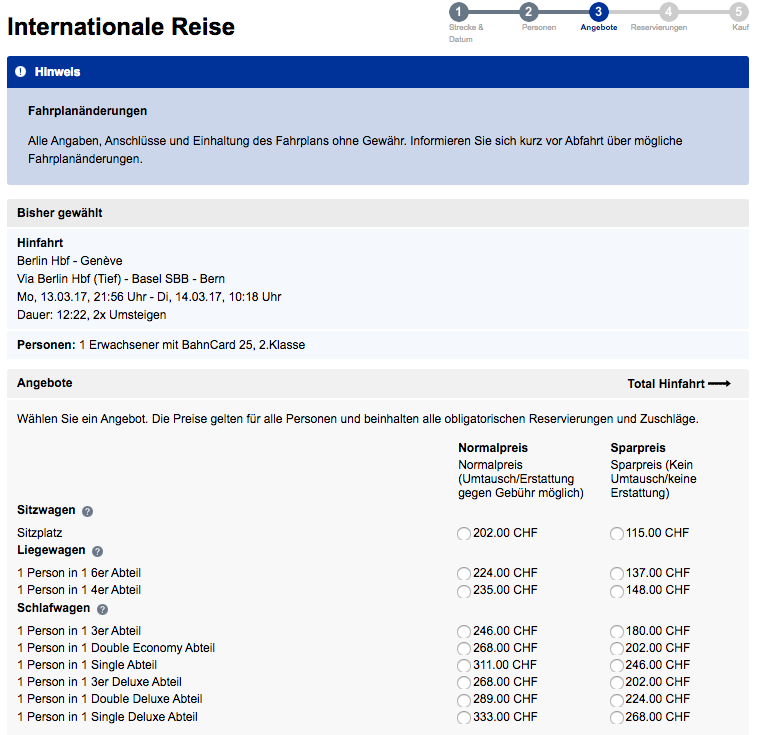 So I can do the trip for €39 Berlin – Basel SBB, and €29 Basel SBB – Genève. €68 total, or a saving of €39.40 in comparison to ÖBB’s best offer, or a saving of €176.40 in comparison to DB. But anyway, if you do want the cheapest NightJet from Germany to Switzerland, plus an onward connection, now you know how to do it! So as if all this was not complicated enough, @Zugreiseblog on Twitter pointed out a further trick – to try booking to Basel Bad Bf (the DB station in Basel), and not Basel SBB. And hey presto, a bunch of better deals for a Schlafwagen than I can get off ÖBB’s site. So what happened when I actually tried to book this? I used the Basel Bad trick explained above and then, for reasons unknown, it reduced the cost by a further €4.00 on the final booking screen. 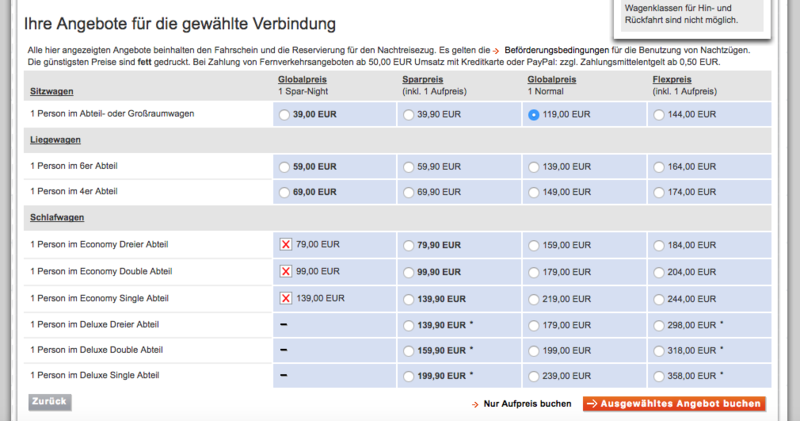 So Berlin – Basel Bad in a Schlafwagen 3er with a BahnCard 25 for just €66.90. Quite good! @hans – sorry but that’s then ridiculous. Surely night trains ought to be able to be compared with daytime trains? Sure, you need to add a Liegewagen or Schlafwagen reservation, but beyond that prices should be comparable. Hello Jon! Killian is right here. Since some years, ÖBB sells Sparschiene with connections only for day trains, so Sparschiene through tickets can be sold for Innsbruck – Geneva (and also Vienna – Geneva) if using day trains. If you use the nightjet train (e.g. from Vienna to Zurich), ÖBB will sell you a so-called global priced ticket (Killian called it “IRT ticket”) for the night train to Zürich, either full fare or discounted with Vorteilscard, or also as a redcued fare tickets, which are for some reasons called Sparschiene as well. 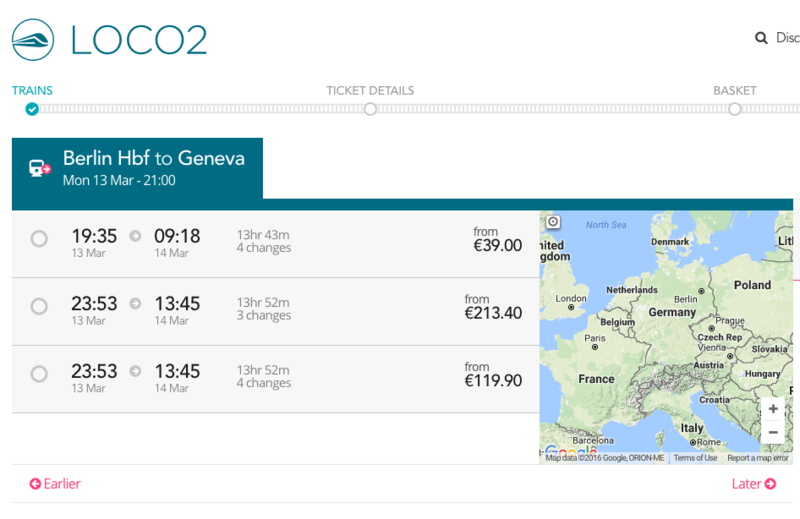 For the Zürich – Geneva leg ÖBB would sell a normal international ticket (maybe with 25% off because of Railplus). I discussed that with ÖBB staff, when they introduced that pricing system for their night trains some years ago. I told them, that longer journeys like Wien – Amsterdam or Wien – Brussels, Wien – Geneva or Graz – Hamburg or Graz – Gdansk involving a night train and a connecting day train would become much more expensive. They said they were aware of it, but the so called global prices would make yield management easier and that it would be easier to offer competitive fares for night train journeys without connections. DB on the other hand still sells normal tickets or Europa-Spezial tickets with seat or berth reservations. 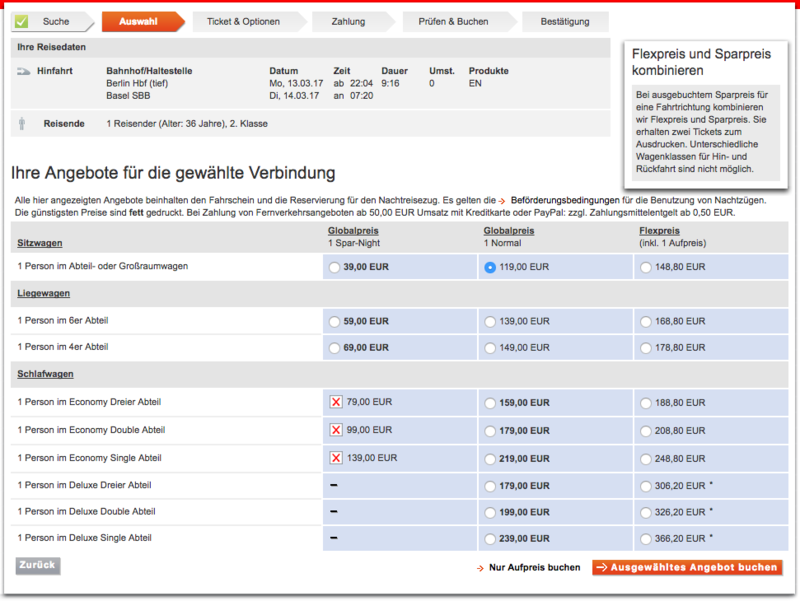 Depending on the journey, it can be cheaper to book via DB or via ÖBB. @killian – you did not see my reply to Klaus here. ÖBB *does* offer cheap Sparschiene tickets to Swiss destinations if you book from Austria – it works for Zürich – Genève for example. But for now this does not work for DE-CH connections. There are 2 issues: what is a fair price for a rail ticket? (and within that, what subsidy should there be). Second, can the passenger get the cheapest fare without having to resort to stupid tricks? ÖBB decided a few years ago to sell only IRT (Integrated Reservation Tickets) for their own Euronight trains, including Sparschiene EuroNight (now Sparschiene nightjet) tickets. Normal ÖBB Sparschiene tickets on the other hand are NRT (Non-Reservation Tickets). So they are bound to specific trains, but you can buy them for connections including changes, which is not the case for any “Sparschiene nightjet” ticket. 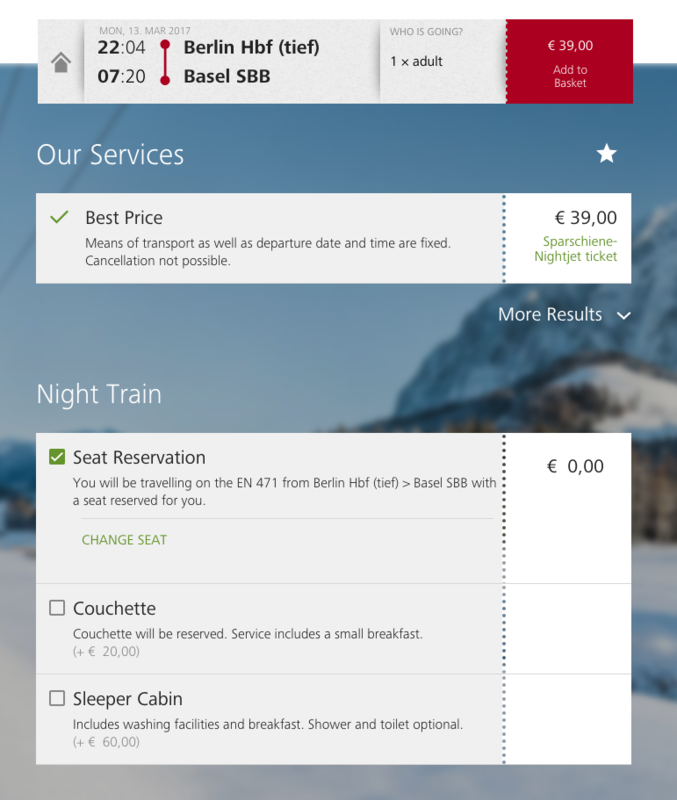 When ÖBB introduced this kind of ticketing for their own overnight trains, DB managed to find an agreement that they can still sell their Normalpreis and Sparpreis tickets for ÖBB EuroNight trains. It has definetely been possible for the new ÖBB train Zürich-Hamburg when booking before December 11 and it will be possible again in the future. I just hope that they can get it fixed quickly. Regarding Sparpreis and Sparschiene tickets to Switzerland: Of course DB and ÖBB do not waste taxpayer money by selling cheap tickets for the Swiss part of the journey. SBB will always get a part of the fare for the Swiss segment. At least on German Sparpreis tickets you can see how much it is because the German part of the fare is quoted for calculating VAT. So in the end SBB will get less than their Normalpreis fare for the respective route but they have to agree to that, otherwise these tickets counldn’t be sold. By the way, SBB sells cheaper Sparbillette, too, so not only Normalpreis fares within Switzerland. @klaus – thanks re. Sparpreis and Sparschiene names. But you are wrong re. 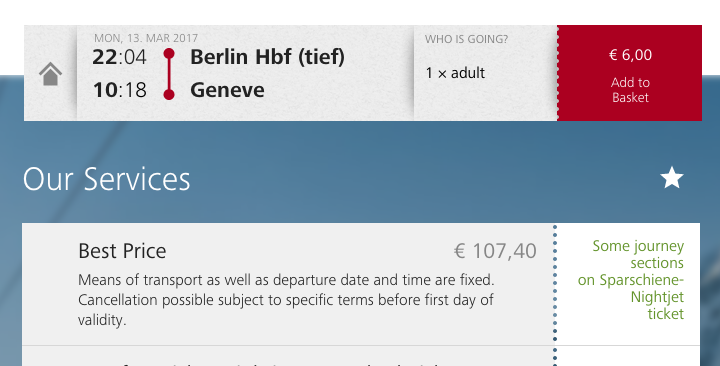 the prices – you can get a Sparschiene at €39 for a Innsbrück – Zürich – Genève ticket, so why can you NOT get roughly the same for a Berlin – Basel – Genève ticket? That’s the inconsistency. And yes, I know Switzerland is expensive if you need to pay the Normalpreis, but that’s a different point. As for your ÖBB taxpayer point – sorry, tough. ÖBB took a business decision to operate these services, and is supposed to be able to run them for a profit. The essential issue here is this: it should be possible for passengers to get the cheapest ticket available for any trip, regardless of whether it crosses a border or not, and without needing weird tricks. At the moment – as this example demonstrates – this clearly is NOT the case, and that is not right. It’s possible to book direct-tickets Berlin-Geneva with Nightjet-unse, bus only at the ticket-desk and the ticket dispenser on the German-railway-stations. The problem is that Deutsche Bahn doesn’t want to make the ticket-sales for the night-trains on internet better. It was 5 years ago so, and still now. Hi John, I think you are confused, because you mix up two different systems. Sparpreis is only valid for Deutsche Bahn, but I understand that it’s maybe confusing, that the Austrian railways use a similar term called Sparschiene. There is no further reduction on Sparschiene-tickets, so you don’t get your 25 % bahncard-reduction. You get that reduction only for the regular prices.If you use different trains of different companies, you have to buy two tickets, unfortunately switzerland is an expensive country, the journey from basel to geneve costs around 80 Euro – and that’s the price, which everyone has to pay; if the Deutsche Bahn offers you a 29,- Euro Ticket from Freiburg to Geneve, well, it’s their decision, somehow they have to refund the money to the Swiss Railway, as Austrian taxpayer I’m quite glad that the Austrian Railways don’t use their money in order to sell cheap tickets for switzerland, it’s completely enough that they sell cheap sparschiene-tickets for their own trains. Weird. You can book Europa-Spezial Schweden tickets which include that train and on that date. DB’s website says €83.90 for Sparpreis and €321.20 from Stockholm to Basel Bad Bf (change trains at København H and Hamburg Hbf and only there, total travelling time 37:45 hours), departure from Stockholm on 12 March so that you get on the night train on 13 March. Why can’t Europa-Spezial Schweiz be booked for the same train? 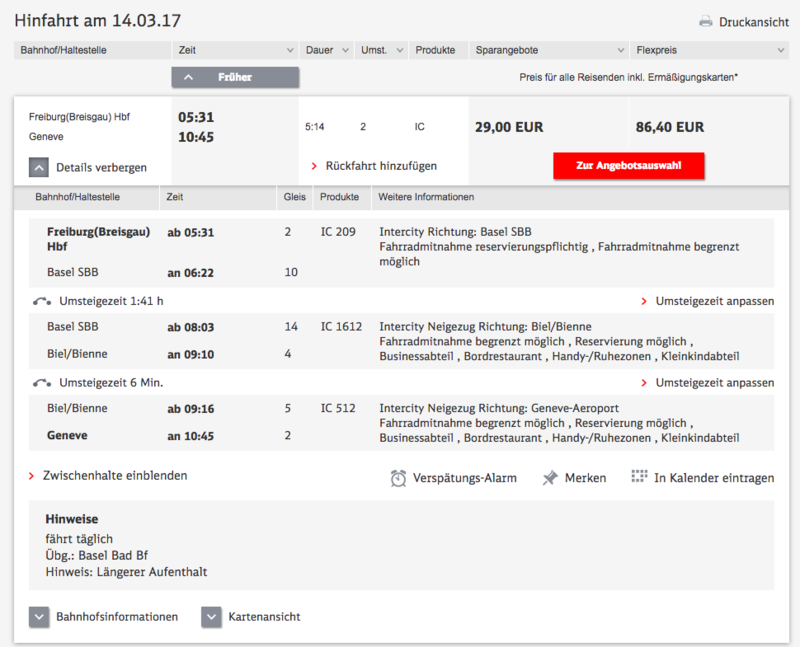 It is a temporary bug in DB’s booking system that Sparpreis Europa tickets on some of ÖBB’s Euronight trains cannot be booked. Before the timetable change, it was possible and I booked one succesfully. It should be fixed around December 20 (source (in german): http://www.ice-treff.de/index.php?id=456979), so please check DB’s website again around that time! Of course, the situation is not the best at the moment, but it is not permanent. 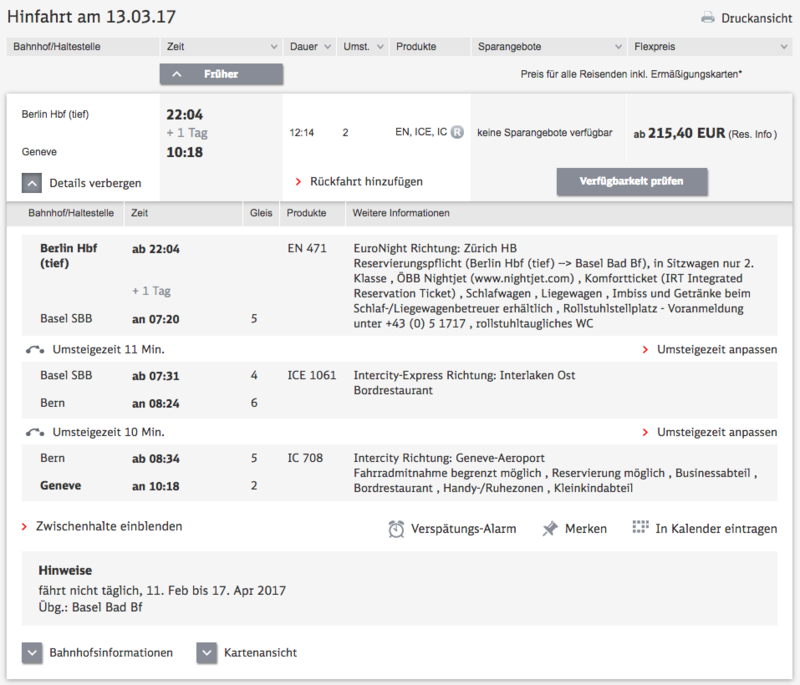 In general, Sparpreis Europa tickets for ÖBB’s EuroNight train Hamburg-Zürich should be bookable just like they were before for DB’s CNL trains.